CorningWare 411: Visions of Flowers - Visions by Corning in Floral Patterns? Visions of Flowers - Visions by Corning in Floral Patterns? Normally, I do not cover Visions by Corning from the 80's & 90's. I don't collect it, and I definitely am not a fan of cooking in it. Visions, though a glass ceramic like Corning Ware, is actually a different formula known as Calexium. While I will admit that it is kind of neat to watch your food cooking through the Amber and Cranberry hues of this cookware, Calexium tends to be stickier on the stove than Corning Ware, even if you keep the heat on the low side. It is because of this that so many of the pans began showing up in the 90's with a teflon coating. Which is another reason that I don't collect or use Visions... I refuse to have anything to do with teflon coatings. That being said, a couple of interesting things have surfaced recently that I thought I should bring to people's attention. After all, even though I do not collect Visions myself, that does not mean that others do not, and it IS a Corning glass ceramic product. On top of that, I have covered Princess House Nouveau by Arcoflam, Pyrosil Ware and Pyroflam from Europe as well as Anchor Hocking's short lived glass ceramic cookware and, to a much lesser extent, Narumi's Neoceram, so it's ONLY fair to touch on Visions cookware as well. It was in the 1960s... Corning Ware was already being produced and was a highly successful product. The white cookware with the Blue Cornflower was gracing stove tops all over the country. 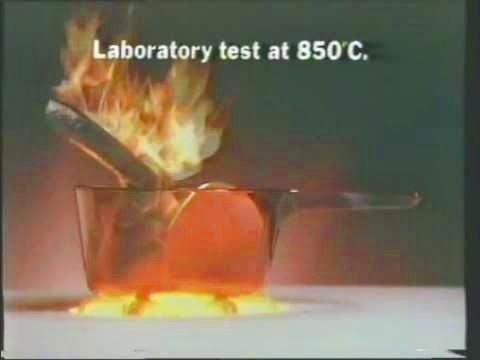 Corning Ware is made of what was dubbed as "Pyroceram", by Corning Glass Works. It is opaque white because of the Titanium Dioxide that is used as a nucleation point for the crystal growth that changes it from an amorphous glass into a crystalline ceramic product. Even though Corning Ware was a resounding success, it didn't stop Corning Glass Works from researching into new and even more inventive glass ceramic products. Thus a new form of glass ceramics was developed.... It was translucent, even after it had been through the crystallization process. Corning decided not to produce cookware from this new "Calexium" formulain the U.S., because they did not want to cut into the sales of their current "Corning Ware" product. Thus, "Visions" would have to wait. 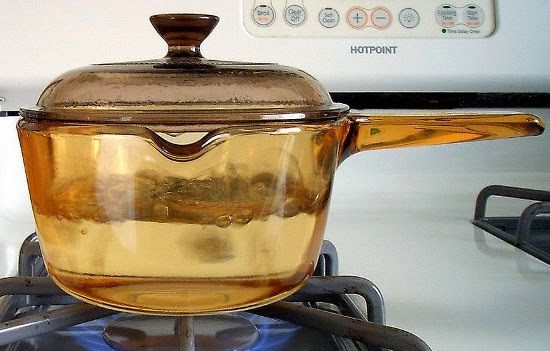 In the late 70s, when Corning Ware sales began to slump, Corning was already producing this "Calexium" cookware in France, so they decided to do a market test for this new translucent amber material. Thus, in 1981, pieces were imported into the U.S. and market tested by Imoco in Irving, TX (the same people that would later market Corning Ware's Autumn Meadow pattern in 1984-85) and LeClair in Clinton, NJ. ANYWAY..... Visions was an instant success... EVERYONE had to have it. Even the Martinsburg, WV plant was retooled to keep up with the demand. But the issues with sticking began to surface after a few years. By 1989, Visions would have it's bottom surface coated with Teflon. 1989 also brought about the Visions "Sculptured" line. It appears that these pieces, which included a large roaster shaped like the F-14 in French White, did not sport any Teflon coatings. What has stimulated this post, however, are some interesting pieces that have recently shown up on eBay. Evidently, there were "patterns" on some of the Visions pieces and sold under the "Deco" line.... 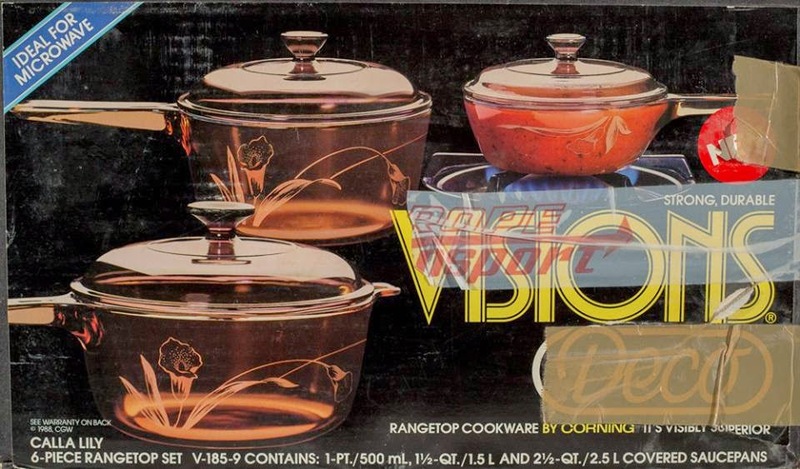 It is unclear, at this point, just how many patterns were produced in the Visions "Deco" cookware, but to date, they only appear on Amber Visions, not Cranberry. This leads me to believe that they all predate 1992.